About FTDI FT232RL breakout board: This tutorial is about making Arduino on breadboard using a basic FTDI FT232RL based breakout board.The pinout of this breakout board matches the FTDI cable to work with official Arduino and cloned 5V Arduino boards. It can also be used for general serial applications. The major difference with this board is that it brings out the DTR pin as opposed to the RTS pin of the FTDI cable. 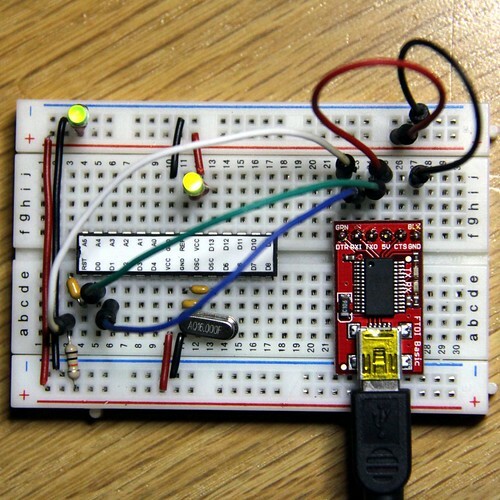 The DTR pin allows an Arduino target to auto-reset when a new Sketch is downloaded. This is a really nice feature to have and allows a sketch to be downloaded without having to hit the reset button. This board will auto reset any Arduino board that has the reset pin brought out to a 6-pin connector. There are several tutorials available for making Arduino on breadboard using FT232RL breakout board. You may follow the following images to make one. DTR pin goes to one pin of 0.1uF capacitor and the other pin goes to reset pin(Pin 1) of ATmega328. RXD pin goes to TXD pin(Pin-3) of Arduino. TXD pin goes to RXD pin(Pin-2) of Arduino. VCC pin goes to pins 7, 20 and 21 of Arduino. 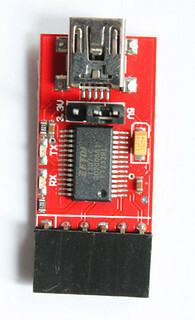 CTS pin is connected to GND. GND pin goes to pin 8 of Arduino. I have used this breakout board for programming serial LCD kit. The instructions are totally wrong and don’t even match up with the picture. I see the led’s have no resistors. Is CTS going to ground or not?